Recommended to: Readers who love Sci Fi books, and huge worlds that are built around them. 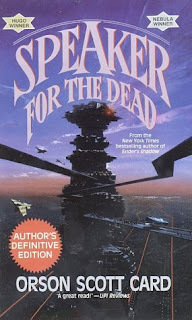 In the aftermath of his terrible war, Ender Wiggin disappeared, and a powerful voice arose: the Speaker for the Dead, who told the true story of the Bugger War. Now, long years later, a second alien race has been discovered by Portuguese colonists on the planet Lusitania. But again the aliens' ways are strange and frightening ... again, humans die. And it is only the Speaker for the Dead, who is also Ender Wiggin the Xenocide, who has the courage to confront the mystery ... and the truth. Orson Scott Card infuses this tale with intellect by casting his characters in social, religious and cultural contexts. I didn't think it was possible, but this book was even more intriguing and amazing than Ender's Game. Yup, I said it...and I simply adored Ender's Game so that's a big deal. The depth that this book has just amazes me. I was so invested in all the characters that I found myself getting angry when they made poor decisions. I wanted to jump into the book and yell at them. Or when they made hard decisions, I wanted to give them the companionship they were looking for. It takes a lot for a book to make me cry and only this and the Hunger Games have succeeded in that. This book also has depth in what it addresses in terms of politics, religion and the like. I can see why others were disappointed. It is definitely not as action packed as the first book. However I think that is truly what makes this book so much more touching. It reaches in and wakes up parts of you that you aren't sure you were willing to deal with. I can see why older readers would get more from this than younger readers as well. I am not sure what else to say, besides the fact that this is a great book. If you are a lover of Science Fiction, if you enjoy books that make you think about society, this is a book that you will fall in love with. Orson Scott Card has my undying love now. I cannot wait to see what else he has in store for me.